What’s your most inexpensive beauty item? What’s your most expensive beauty item? Most inexpensive: over the years I’ve picked up many beauty items for a dollar, but the one that I use regularly is the Wet n Wild eye shadow in Brulee, which is a fantastic brow highlight shade. My goal is to use the whole regimen this winter! What brand takes up most of your collection? MAC for eye shadows (75) and Essie for nail polishes (81). No shame, and I will indulge in more from both brands in 2016! Contouring products. I’ve picked up a few products specifically for contouring, including NYX Taupe blush, MAC Sculpting Powder in Sculpt, and Illamasqua Cream Blusher in Zygomatic… but I hardly ever contour my face. Concealer. I feel like without under eye concealer, I look really tired and almost sickly. My current favourite is the Maybelline Age Rewind Eraser (see my comparison post of my Maybelline concealers here). Which item is at the top of your beauty wishlist? I saw this reviewed on beautyisles, in which she compared it against YSL Volupté Tint-In-Oil ($35) – it was an instant lust! Which makeup product looks great on other but not on you? * Explanation of the header image: apparently there is speculation that the characters Spongebob Squarepants are based on the 7 deadly sins – interesting idea. Moving on, that Sephora. Anything that I see of great price for good quality is definitely a thumbs up! I got curious about that Korean brand, that must be a wow considering who used them. Definitely would watch for your reviews. I also envy girls who could strout a bold lippie. Me, would definitely look like a horror clown trying to be sixteen. If only ours could have great deals on Essies and the likes, definitely would hoard also. Yes, that buy 4 get 2 free definitely enabled me to hoard more Essies, lol! But MAC never goes on sale unfortunately – boo! Really? I thought the same way goes to all. I mean MAC has been in every give away that i’ve seen so there must have been some great deals going. I’m with you on the contouring. I never have time/energy. Yes, you have to get your hands on Brulee, it’s such good quality and a very useful shade! Yeah I’ve done so many tags lol. They can be hard to keep up with haha! 🙂 Will def get on getting Brulee! This is an awesome tag! Gotta add it to my now queue of posts I plan to work on. How you feel about bold lipstick is how I feel about dark lipsticks. I want to wear Vampy colors sooooo bad but I look so stupid! Haha. Great post, I enjoyed reading it 🙂 P.S. you better get on that skincare set, girl! Haha WnW Brule is the best brow highlight! I keep it handy in my vanity because it’s so good. Yes, I have mine depotted into a special highlight z-palette! Haha, yes it’s super handy to have them all in one place. Same with my transition shades! I hunted for Illamasqua Hollow but it was sold out everywhere, and then the brand left North America! But really, not a big loss since I hardly ever contour! I admit it. I LOLed at that Korean skincare set entry. 😀 Similarly, I have a Lippmann nail polish set that I still haven’t used (and it’s 1.5 yrs now). History of Whoo totally made me think a Dr. Seuss, though! You gotta wear what you’re comfortable with, but I bet you’d rock a bold lip! Maybe not as neon as the one in the pic 🙂 Full lips are perfect for bold lips! I’ll have to test out a bolder lip this weekend – I’ve got a birthday party to go to! Highly concerned about your freckles?! I love freckles. Screw those dumbass SAs. Oh yes, definitely splurge on theBalm, they’re so good! 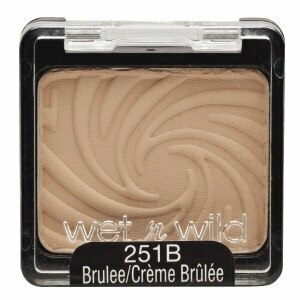 Wet n Wild has a ton of great stuff – definitely find the single shadows. There’s a taupe shade that’s really pretty too! See I’m always in a rush 😀 I haven’t actually tried eye shadows only face products, never say never though! I hope to hear how you get on one day!